Today's scenery is the best we have seen to date in Uzbekistan. The initial lush farmland quickly transforms into a rocky landscape with very little vegetation but an amazing combination of rolling greens, golds and browns. A snow-capped mountain range silhouettes our right-hand view. Contrary to the information given to us about it being flat the whole way to Tashkent, there is quite a decent climb just before Jizzakh. While the percentage doesn't match the "standard issue 12% signs" on every incline in Uzbekistan, most of the way is a tough 8%. It is especially difficult in the heat of the day and today is a blistering 48 °C in the sun. We engage 10 hours in total on the road, whereby just 6½ hours are spent in the saddle. We can't drink enough and the cold bottles of soft drink and water, at the numerous bus stops and chaikhanas [teahouses] along the way, are a welcomed thirst quencher. After reaching the 870 metre peak and climbing a total of 477 altitude metres, we enthusiastically sail down into the valley as best we can on poorly laid asphalt. The road for the next couple of hours is flat, but irritatingly bumpy. On the M39 near Uchtepa (123km; 477m) we pull off in a field at around 6.00pm. We are startled awake by the sound of bleating sheep and goats next to our tent and unzip the flap to some rather curious young shepherds who take to standing right in the doorway and staring for at least 15 minutes. As soon as they leave, we eat and finish packing up. Today is as hot as yesterday, but there is not a hill in sight. In fact, there's very little to see in the way of scenery and it is a long and rather boring cycle. Fresh water canals are lined with boys and the occasional man cooling themselves off from the heat of the day. No females seem to be participating in this rather inviting indulgence. The roads are particularly bad towards the end of the day in and around Gulistan. We opt for a patch in between the railway and the highway on the M34 near Gulistan (112km; 63m) which proves to be noisiest camp spot we have chosen yet. The photos we take, on the other hand, depict a green and serene setting. A couple of local kids beg persistently at the tent before finally disappearing over the train track and we begin with our restless night. It is early when we hit the road today, even though one of my spokes needs repairing before we set off. An almost perfect highway and overcast skies are like a dream come true, but it doesn't last the entire journey into Tashkent. The dry nothingness of yesterday becomes a lot greener as we approach the 2½ million populated city. The cotton and wheat fields give over to a cherry, strawberry and tomato culture. I also spy rock melons on sale and a craving remains with me for the rest of our journey. It is curtailed after a visit to the Chorsu Bazaar and even though it is a rather expensive exchange of sum for this piece of fruit, it is worth every cent. Fruit in general is not cheap in Uzbekistan and outside Tashkent there is little choice apart from local apricots, cherries and crab apples. Alternatively, cabbage, potatoes, carrots and most root vegetables cost hardly anything. Going past Sirdarya, about 100 kilometres from Tashkent, we are surprisingly joined by a cyclist in training. Well actually, Ali is. This guy flies past me on his fancy bike, in all his racing gear glory without a word of a hello and then sidles up to Ali and holds out his padded glove hand in manly handshake gesture. For the few kilometres that he stays with us, the road is smooth and flat and we have a helpful wind in the back. Uzbekistan has numerous checkpoints along the way and of late we have been riding straight through them, with a friendly wave and smile of course, and the boys on post haven't prevented us from continuing. The repetitious stopping and silly questions wears a little thin after a while. For those of you who are unfamiliar with the rules: when travelling in Uzbekistan you are technically required to register everyday. This is no longer possible through any other mode than your hotel which obviously means wild-camping cyclists and those taking night transport are unable to meet the requirements. Most reports from travellers reiterate that you are seldom asked at the border for your registration slips, especially if you have been travelling overland. We will just have to see. Added to the list of regulations, you must have your passport on you at all times and technically any militsia [policeman] has the right to check your documents and search you. While this rarely happens anywhere else other than the notorious metro system in Tashkent it is best to be prepared. There are mixed anecdotes, but we have found that the best approach is a firm and decisive decline to their request and they generally leave it at that. Always stay in public view and never go anywhere with the police. If it appears to be getting out of hand, play authority against authority and demand their identity number, motion to write it down and if you have a mobile phone, attempt to call someone. As a last resort, make a scene. An underhanded cop doesn't want to draw attention to himself. We make it into Tashkent (100km; 322m) - a city akin to a poorly maintained Singapore - with its ample lane boulevards and abundance of greenery. The immediate feeling is relaxed. It is Sunday and we virtually have the roads to ourselves. There is one sign indicating the city centre on the outskirts of town and if you keep to this road for about 15 kilometres you will eventually happen upon the easy to see Sirk [Circus]. Go under the tunnel and head north west. Once you have passed the arch at the Chorsu Market, the next street on your right with a traffic light, is the road leading to Gulnara B & B [Uzman Hajaev 40]. There is an arrow sign on the shed roof near the corner. Gulnara B & B is, from most travellers point of view, the best and only place to stay in Tashkent. It is unbelievably clean and the family that run this place are extremely relaxed and friendly. Price wise it is expensive at US$15 per person or US$25 for a double with shared bathroom. There are a couple of double rooms with ensuite for US$30. Compared to other accommodation prices and standards in Tashkent though, this is reasonable and includes a very delicious and filling breakfast. While on the subject of food, like all the Central Asian countries so far on our trip, vegetarians will have a hard time finding a variety of dishes to keep them satisfied in Uzbekistan. Meat is a staple. There are Korean salads at all the bazaars, but a few nights of MSG overdosed noodles and vinegar soaked cabbage is enough for anyone. We venture into Darxon on Pushkin, opposite the Inconnel Business Centre and very much enjoy a traditional plov dish without meat. Beer on tap is also at local prices and a pint costs 450 sum. It is situated on the extreme east side of town, but a taxi ride across the city should not cost anymore than 2000 sum. Brace yourself for some heavy bargaining and if they don't come to the party, try the next taxi in line. Tashkent is not short of taxi drivers and the streets are a sea of Lada's and Daewoo's prepared to take you anywhere. Remember though, the city is forever under construction renovation so, have plan B ready if heading to one of the holy guidebook's recommendations: Hotel Locomotive, Taj Indian Restaurant, The Café and New World Pizza and Bakery are no longer around. Arrive Pakistan Embassy at 10.30am to fill in application form with three other travellers staying at the same guesthouse as us. [New location at Building No 15, Kickik Halga Yoli Street, Sobir Rakhimov District, Tashkent. Open Monday through Wednesday 9.00-13.00 and 14.00-17.00]. Purchase our 4 pass photos with blue background from shop up the road along with copies of the Uzbek visa and our passports. Submitted these before 12.00pm and told to come back the following day at 3.00pm for an interview. Arrive Kyrgyzstan Embassy at 2.30pm [Holida Samatova 30, Tashkent. Open Monday, Wednesday and Friday 9.30-11.00 and 14.30-16.00]. Everything processed same day and within 15 minutes for a 30 day single entry visa at a cost of $US55. [Multiple entry: $US75] Required the application form, one pass photo, copy of passport and Uzbek visa. Five of us turn up for Pakistan Embassy interview at 2.45pm. We are let into building at 3.20pm. We are let out at 3.25pm before we can make the seats warm and after greeting each of us and asking each of our names. We were informed as a group that we need to pay the visa fee and hand in our passports after 11.00am the following day. They are unsure of the fee, but will let us know tomorrow. They are in a hurry today and therefore the interview is short. Arrive Chinese Embassy 8.45am. [Yakhyo Gulomov 79, Tashkent. Open Monday, Wednesday, Friday 9.00-12.00]. The gate opened at 9.20am. We fill in the application form and attach one pass photo. Same day application costs $US80 but you can't pick your passport up before 5.00pm and our passport needs to be handed in at the Pakistan Embassy before this time. The Chinese officials won't allow any concessions and can be overly impolite. Three day and 5 day applications cost $US60 and $US40 respectively. We leave for the Pakistan Embassy via MIR shopping arcade with a real coffee bar. We hand in our passport and pay $US36 each at 11.00am at the Pakistan Embassy. We are told to return following day at 3.00pm to pick up our passports. Pick up passport at Pakistan Embassy. Arrive Chinese Embassy for one day processing of a 30 day single entry visa. Application form with attached pass photo, US$80 plus passport are required. They don't give you a receipt when you hand over your money and it confuses them to ask for one. You will get it when you come back at the designated time of 5.00pm the same day. On the dot, one official arrives at the fence armed with a red plastic washing tub full of passports. Situated on the other side, we must pass our collection slips through the metal bars in exchange for our newly processed passports. It is imperative that you arrive on time. Within 6 minutes he has disappeared again. It is Saturday and early morning, which makes cycling out of Tashkent quite an easy task apart from the unbelievable amount of traffic lights and one annoying driver who thinks he has the right to run Ali off the road. About 18 kilometres out and we are well and truly back in wheat and cotton country and the aridness continues until the turnoff to Angren, which is not signposted at all. At the highway t-junction turn right in the direction of Almaliq, go over the bridge and take the first turnoff on the left: here is a police post. This road leads into Ahangaran where there are plenty of chaikhanas to stop and rest at. Just out of town there's also a toilet stop, which is surprisingly enough, kept in reasonable condition and costs 100 sum including a small ration of toilet paper. Early afternoon and we find ourselves following the paces of a runaway donkey down the highway. He is going hell-for-leather until a green patch of shrubs at the top of the hill catches his eye and stops him in his tracks. His preoccupation with the succulent plants means it is quite simple catching him and he doesn't mind at all being lead towards his owners, a half kilometre or so away. They are very happy to get their naughty little escapee back. We move on through a not so interesting countryside. It is a tiring, very long and not such a pleasant ride today. By late afternoon and we reach Angren: an ugly city with otherwise beautiful views of mountains spoiled by an electrical plant and decrepit apartment blocks. Keeping in similar vein to many shop owners, we are ripped off yet again at the petrol station, just before the town. They just seem to take every chance possible to jack the price up by two or three hundred percent. Luckily, after nearly twenty days i the country, we are a little familiar with local costs and in most circumstances, refuse to pay. Close to the railway lines children throw stones at me for the second time in Uzbekistan and in all honesty, the country has been quite a disappointment as far as cycle touring is concerned. It is definitely way down on our list of favourite places to pedal through. 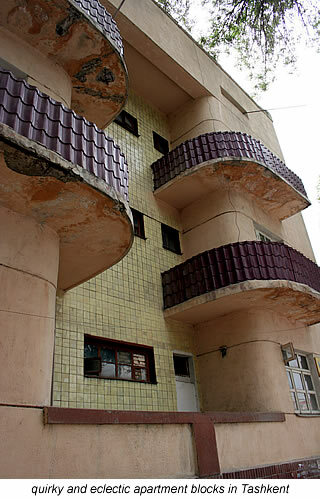 It is not only the grunting, whooping and incessant whistling at us, but the over-priced accommodation in comparison with everyday life, the uninspiring scenery, the evident corruption on each street corner especially when it comes to the police, the bureaucratic nonsense and a severe lack of hygiene in general. For the first time in our camping experience in Uzbekistan, we manage to find a great spot near Angren (120km; 828m) next to a running stream and where no-one bothers us for the entire evening and early morning. We remember nothing as soon as our heads hit the pillow. Today's cycle touring is a complete contrast. Apart from the very non-European roads, you might be mistaken for thinking you are in Switzerland: green luscious mountainside with pine trees and fast flowing rivers It is really stunning scenery and it is a really hot day again. A group of boys join Ali for the first part of the ride around a massive lake, where they intend to go fishing. The climb doesn't really begin until 900 altitude metres below the tunnels. It is 14 kilometres of hard and steep gradients with an average of 7% that even keep the gas trucks at around 6 kilometres per hour. My legs don't seem to want to move up the first section at all and I am still hampered slightly by my recently fractured ankle on really heavy workouts. I revert to pushing for part of the distance. There are enough shops along the way to get water from but it always pays to ask the price first. We are both pleased when we reach the top. The tunnels are 1100 and 400 meters in length and hardly the major bypass mentioned in the guidebook. Our joy is dashed a little when the descent is almost as slow as the ascend due to exceptionally poor road conditions. Just outside of Qoshminor (88km; 1269m) we find a semi-secluded spot to camp in the only no-man's land for miles. It is peaceful enough until a sand storm picks up and blows us, the tent and the desert roses around a bit. We enter the start of the Ferghana Valley today: the most populated area in Uzbekistan and rumoured to be the most conservative too. It is certainly green and many vegetables and fruit trees are represented in this area. Again, it is really warm by 10am and many rests are needed along the way even though the road is very good and flat for most of the journey. We reach Ferghana (128km; 330m) pretty late and book into the cheapest room at Ziyorat Hotel [$US14 per night]. It is nothing special and the electricity is a little dodgy, failing more than once on us, but does serve a fairly decent breakfast in the restaurant-come-disco hall downstairs. We are ready for a decent meal and our tired legs are pleased with the decision to take a taxi to the Asia Hotel restaurant. There are a few vegetarian dishes on the menu and they are reasonably good however, the homemade french fries win the culinary contest hands down. A fairly expensive bill arrives at the end of it all, but everything has been well enjoyed. We stay an extra day in Ferghana to visit the silkworm factory in Margilan, which has to be the highlight of our whole Uzbek experience. I remember raising a few hungry grubs as a kid; preserving the hard to find white mulberry leaves which they dine on in a plastic bag in the fridge. We would get excited as they grew so quickly and began to build their protective shells which they covered in silk thread. They knew little of their later fate of being boiled alive in their cocoons. We would then wind the silk off onto a strip of cardboard and allow a few cocoons to hatch and lay eggs. These were then passed onto someone else's kids to complete the life cycle all over again. The Yodgorlik Silk Factory still keeps up this tradition for tourists to see on a scale much larger than I could have imagined. The whole process is amazingly time consuming and our English speaking tour guide is thoroughly informative. Afterwards, you do feel quite obliged to purchase something from their shop though, but seeing as it is a community based project it does appear to go to good use. There's little else to keep you in Ferghana, unless you want to visit another crowded bazaar or enjoy visiting the open-air discos with leering groups of men including fathers teaching their primary school aged sons to pop 200 sum notes in the bikinis of a belly dancers. It is an uneventful trip into Andijan (74km; 201m) although the distance boards have us guessing the whole way, due to their absurd discrepancies The town itself is nothing to write home to mum about and finding a cheap hotel proves more difficult than we expect. The main boulevard is lined with large, out of place, modern buildings, the streets are filled with not so modern faces. It has a border town feel about it. On the way to find Hotel Andijan - that we soon after learn from other travellers, is pretty grotty and has no water - we stop in at several other places to enquire after prices. Considering that the hotels look like slum apartment blocks with putrid toilet and bathroom facilities, we find the $US40 per night price tag a little over the top. One owner takes us to a home stay quite a distance out of the centre, though in the same direction of Hotel Andijan. Unfortunately, it is full, but they do have a spare room in other quarters across the road. It is $US14 per night for a reasonably clean room with substandard share bathroom facilities. We later work out that our room has no ventilation, which results in a rather sweaty and uncomfortable night's sleep. On a more positive note, the bazaar in Andijan is the most traditional and interesting we have seen to date. The only thing to comment on, but certainly worth mentioning, is the fact that 10 kilometres from the border with Kyrgyzstan, I manage to ride smack bang into a car parked on the road. Yes, it was parked. No, I didn't see it. Yes, I think I'm okay. No, my bike isn't as I discover, once back in the saddle. My toe-clips keep scraping on my front tyre due to a completely bent front fork. Luckily, I hit the bumper straight on, which meant both sides of the fork were evenly pushed inwards. So, my bike is still ride-able, but not able to turn corners very well. The Daewoo Nexia leaves the scene of the accident with just a small tyre graze on its lower bumper. We continue on to the border where apart from having to fill two sets of declaration forms in at Uzbek customs control, it is a relatively painless ordeal and only takes a miraculous half an hour for both country's formalities. Osh (60km; 577m) is about 10 kilometres from the border and we arrive reasonably early in the afternoon. Osh Guesthouse takes a bit of effort to find and for 180 som each [1 Euro = 50 som], we can have a dorm bed. This place fills up quick due to it being mentioned in the Lonely Planet. After a few days of being locked out, having no water or internet access and tippy-toeing around in an extremely dirty kitchen and bathroom, we and some other guests tell the guys running it what we think. to their credit, immediate changes are made and the place is spruced up. We have to thank them too for putting us onto a really good bike shop: the only one in Osh. X-Store / Bike Master, is unfortunately no longer in operation, but when we go there it is run by two young bike enthusiasts: Nicolai & Max. It is perfectly clear that my bike is in good hands and we leave it overnight for them to figure out what they can do. The next day there is a freshly spray painted second hand steel fork as one option and the second solution - which Nicolai is prepared, but not so keen to do - of taking the fork off one of his bikes to fix mine. The cost would be 500 som and 1000 som respectively. Option number one is fine by me as the fork looks in good condition and is strong. It needs to have the top thread turned since it is a little too long for the Sunn's small frame, but we can come back later in the afternoon to pick it up. While my brakes and gears are adjusted and all my cables are oiled we are entertained by workshop activity and some bike stunts outside. I wake with a really sharp pain in my wrist that just seems to get worse during the course of the day. I had a similar problem after the roads in Turkmenistan and all the way up until Tashkent, but it subsided there. I try to get on my bike, but can't bear the pain, so it's off to the polyclinic in Osh. Everyone is extremely friendly, even though no one speaks English. After a fairly quick consultation, x-ray and wait, I'm lead into another room, where the doctor informs me that I need to put my wrist in a cast. There's a small piece of bone floating at the end of my wrist on the thumb side of my left hand. He insists it is absolutely necessary and assures us, through another patient who speaks a little English that I'll still be able to ride my bike. While the news is a bit of a bummer, I'm more baffled about where the dickens this break actually occurred and totally blown away that the cost of the two consultations, x-rays and half-cast is a mere 150 som [3 euros]. We are still waiting to try that out because the following day I fall ill with the flu and have been lying in bed ever since. Somehow this just doesn't seem to be my lucky year on the health front and extremely ironic after only one visit to the doctor in the last seventeen years. After breakfast at the café down the road from Osh Guesthouse we leave in the direction of Sary Tash with Sky and Casey - an Australian and American couple cycling to Istanbul. They turn off after a few kilometres on their way to Bishkek. Not far out of Osh and the scenery becomes strikingly beautiful. Everything is so green and a prominent contrast from Uzbekistan. Plenty of wild horses have been added to the landscape as well as the usual goats, sheep, cattle, chickens and donkeys. A river flows happily alongside us for the whole journey. We meet up with Sandra, a French cyclist also on her way to Kashgar, at a water stop along the way and we just cycle on together. The road is unpaved in parts, but not too difficult. Though it has it's toll on my bike and the back rack eyelet snaps off my main frame. We also notice that the other side has a dubious crack in the same position. We fix the pannier rack in place with brackets and it will hold for the time being. It is an incessant 2% average climb for practically the whole day, which even if I wasn't riding with a cast on my forearm, is not my favourite sort of cycling conditions. While I don't have any pain from the break itself, the cast rubs my skin and I can only hold my hand and arm straight and in one position. Sandra cycles much faster than we do, but we meet up again at a chaikhana, just before it is time to call it a day. On a flat grassy plain at kilometre 59 on M41 (59km; 1125m), we establish our evening's pitch. 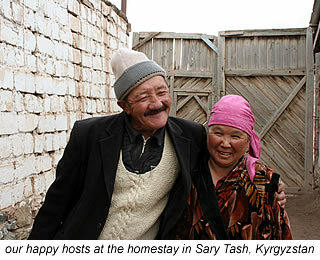 Sandra, on the other hand, doesn't have a tent and finds refuge with a family in one of the yurts across the stream. We leave at 9.30am the next morning, which is a later than normal and the sun is already beating down on us. The riding position of yesterday has caused a considerable ache from my forearm through to my neck and it is a most uncomfortable ride. There are road works and poor conditions for the first 30 kilometres, which also adds to the difficulty. We have the Chyrchyk Pass [2408m] to cross today and it is achieved after approximately 5 kilometres, followed by a long descend into the valley below. Rock faces of red, pink and green tower over us and contrast a perfect dusty blue sky. We seem like miniscule dots beside this rugged landscape. So far, Kyrgyzstan is everything we could have hoped for and more as far as cycle touring is concerned: beautiful scenery, challenging roads, quiet seclusion, excellent wild camping opportunities, a friendly and relaxed atmosphere and that elusive break from that city-influence that we have been bumping into since departing Tehran. We reach Gülchö - 19 kilometres after the Chyrchyk Pass - by early afternoon and stop for a bit of food and a scout around for some provisions. Sweet biscuits of every variety and more are in plentiful supply as is sparkling water, vodka and beer. Apart from these products, you will be pushed to locate much else. Asking at cafés is the best way to obtain bread, tomatoes and cucumbers. It is an easy enough ride on to a truck stop café, where Sandra spends the night and we, 400 metres further on at kilometre 112 on M41 (53km; 673m), next to a raging river. With plenty of climbing in store, we start much earlier today at 8.00am. For a good part of the day we are sheltered from the sun by the massive gorge face. When we finally make it up a steep hill and onto a plateau, the weather turns for the worse as thunder echoes behind mountain ranges. A timely truckers restaurant saves us from complete saturation and we wait it out before continuing our climb. It is time to call it a day by 4.00pm and as we pass through Ak Bosogo (52km; 1080m): the last village before the Taldyk Pass. We are now at 2898 metres above sea level and the highest we have both ever been before. Sandra finds a yurt for the evening and we set up tent close by in the grassy field. It is very cold for the first time since Doğubayazıt in Turkey. The only way to describe the ascend today is tough. While the 761 altitude metres may not seem like a massive achievement, the fact that it was over 10 kilometres long and on the most basic roads we have experienced to date, makes it an extremely intense exercise, both physically and mentally. We were blessed with decent weather though. One drop of rain and the place would have turned into a mud pit. The first section is a mighty incline up and around a couple of mountains until you are facing one large wall of hairpin bends curling into the sky. You can see the trucks putting up and down and the dust is flying in all directions. Luckily it is not so busy. I face a hard time in the sandy sections due to only really having one steering hand in operation, but even without the cast, plenty of stops would have been needed to complete the full climb to the top of the Taldyk Pass [3615m]. We reach this peak around lunchtime and start our descend very slowly down severely potholed and loose gravel roads, only to find that another climb is still in store for us. Since the road is better paved, the next uphill journey doesn't seem as strenuous. The landscape has been magnificent for the entire day and it is a pity our eyes have been constantly glued to the road surface. A two kilometre stretch before Sary Tash (24km; 761m) is smooth and we all make the most of it by flying down into the rural village at 40 kilometres per hour. Our legs and bikes finally moving freely again after an average daily climb of 6% and speed of 8.1kilomtres per hour. We stop for tea at a café and a man beckons us to stay at his home. After checking out a hotel of sorts, we opt for the old man's invitation. It is a comfortable room with traditional mats for beds and costs 100 som per person including food. It is handy to know that showers don't exist in Sary Tash. A day's rest is in order before heading on towards the Irkeshtam Pass and China. We stock up on supplies as there is nothing between here and the border. Immigration and Customs is only open from Monday to Friday and from 9.00-12.00 and 14.00-15.30 Beijing time, which is two hours ahead of us in Kyrgyzstan. Food in Sary Tash is basic and minimal to say the least, but a few cafés stock biscuits, chocolate, juice, water, pasta, rice, eggs, potatoes, onions, tomatoes and cucumbers. You'll have to ask especially for bread. Don't be tempted to purchase their tinned or bottled goods, unless you thoroughly check the used by dates first. And don't be disappointed if they are. These products will inevitably be out of date. If the truth be known, the whole of Central Asia is notorious for expired food products, so remember to check the label dates to avoid opening a tin of milk that spurts thick gooey stuff in your face. I can tell you from experience, it isn't that nice. 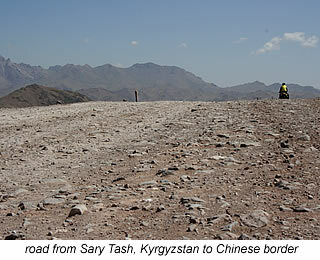 If the road to Sary Tash was bad, then the next leg of our trip is really poor. We are glad that the old man at our home-stay had a welding machine to secure my back pannier as well. It is somewhat of a crude weld and the tubus rack, nuts and bolts are now permanently attached to my bike, which means my frame had better last the distance, otherwise some delicate angle-grinding will be in order. it is quite unbelievable that this is the only and major route from Kashgar to Osh. The truck drivers must really dread this rocky track. If they do, they didn't let on as it is nothing but big smiles, toots, waves and many welcoming hellos as they overtake. Just like them, we weave from one side of the road to the other searching out the flattest, less rutted path. A few kilometres into the trip and I put on a second sports bar for extra comfort. It really is that jolting. Going uphill in this terrain is serious work too, but we are blessed with a tailwind which edges us up and over the rough surfaced inclines. Going down can be just as slow. This would be perfect mountain bike riding for any enthusiasts out there who enjoy the challenge of rugged, wild countryside and want take in some beautiful mountain range views at the same time. There is still plenty of snow on the 6000 metre plus peaks and from our position, it feels as if you could just reach out and touch the velvety white covering. it reminds me of soft ice, which brings on a craving for ice cream in such a warm, sunny setting. Unfortunately the desire is not satisfied, because there is nothing around us except the occasional yurt offering non pasteurised cream and kumis [fermented horse milk]. And even they disappear after 25 kilometres. So does the water supply. We had planned to camp earlier today, but the lack of water keeps us pushing on up to a height of 3584 metres and at an average speed of 10.7 kilometres per hour. It is 4.00pm and we spy a few white dots, far in the distance, which look like yurts. We rest quickly and then investigate the chance of spending the night there. The land surrounding the yurt community is completely boggy and unsuitable for pitching the tent. We are offered a spot next to their camp at kilometre 42 on A371 (42km; 544m). Camping close to the yurts, means you have to contend with the social games as well. I say contend, because while it is amusing enough for an hour or so to play baby-sitter to a bunch of curious kids and the occasional adult too, it becomes tiring when they clearly don't want to leave and sit in the tent opening staring goggle-eyed at your every move. After a hard day's riding, all I want to do is sit and relax and take in the countryside around me, take a wash and then cook dinner without having an audience for the entire time. After our cooking and eating performance is thoroughly enjoyed by locals of all ages, we have had enough and close the tent flap, well before dark. The kids then decide it will be fun to start throwing clumps of grass at the tent. I can't sleep tonight and lay wide-eyed awake until around 5.00am, so when I finally open my eyes after only a few hours sleep, I feel as if I have been out partying all night long. It probably has something to do with the altitude. The out of breath feeling, when cycling or walking up a hill, definitely does. We go even slower today as the roads somehow worsen. It is now a hard-core off-road trail. Scenery is still stunning and the tailwind and sunny skies haven't left us. 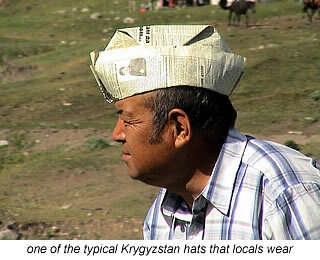 Our hats go off to all cyclists that have, or are likely to travel the other way: from Kashgar to Osh. Completing this route on a loaded bike with its legendary headwinds is gold medal material. The good news for us is, after a very shaky, snail's pace crawl downhill, a checkpoint is in view at about 16 kilometres into our trip. It is the most talked about road by cyclists using this route into China, since it is bitumen, smooth and absolute heaven after two days of shock trauma to the body. And even if it does go up for nearly four kilometres, our eternal thanks goes out to the Chinese road department for this little wonder. After last night, we don't want to camp near another human being tonight and we find an okay place, complete with running stream and far enough from the highway to be safe from unwelcome visitors at kilometre 62 on A371 (21km; 268m). Sandra ventures further on to find somewhere suitable for a couple of nights. We wash ourselves, our hair and clothes in the 'take your breath away' icy water and bask in the sun. I am recuperating from a 24-hour bout of diarrhea, listlessness and total loss of appetite, which is not very practical when cycling at high elevations. Still, the green, grassy patch is very comfortable and it would have been a perfect campsite for another day, had it not been for the plague proportion of flies. Coming from Perth, Western Australia notorious for their annoying little black buzzing insects, I don't get quite as irritated as Aaldrik about their presence. Tomorrow, we will head only a few kilometres up the road, towards the Irkeshtam border and will have to find another place to sleep before an early crossing into China on Monday 2nd July. 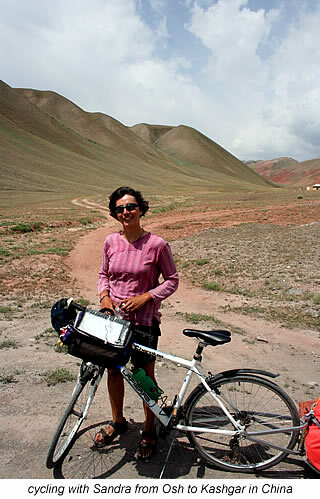 Even with all the difficult roads, we have really loved cycle touring in Kyrgyzstan. Its spectacular mountain scenery and unique rural lifestyle is certainly reason enough to recommend this country to those who enjoy living outdoors and don't mind roughing it a bit, every now and again. Seeing as we only ventured through such a tiny section of the country, it's definitely on our list of places to come back to one day and explore a bit more.